The address ensued after Xi’s name had been added to the Party constitution, which puts him on a part with late paramount leaders Mao Zedong and Deng Xiaoping. Indeed, each of these leaders exemplifies critical phases in China’s postwar history. It was Mao who made possible a sovereign China and peace that allowed the first efforts at industrial take-off. But China’s industrial revolution did not materialize until Deng took over in the 1980s. After three decades of dramatic industrialization, Xi’s first team began the transition to post-industrial society in 2012, which his second team is likely to complete. Wang Yang (1955) is one of Li Keqiang’s four vice-premiers who is expected to become chairman of China’s top political advisory body, the People’s Political Consultative Conference. While Wang is perceived as one the most “liberal” members of Chinese leaders, that’s only a part of the story. He grew up in an urban working-class family in Anhui, a landlocked, agricultural and poorer province in eastern China. Starting as a food processing factory hand, Wang joined the CPC in 1975, served as an instructor in the local Party School and went on to study political economics in the Central Party School in 1979, right at the dawn of Deng Xiaoping’s economic reforms. After the local Communist Youth League (CYL), deputy head of the National Development and Reform Commission (NDRC) in the late 1990s, deputy secretary general of the State Council in 2003-5, Party Secretary in Chongqing. He began to modernize the megacity of more than 30 million people, and Party Secretary of Guangdong, another critical stepping stone. Credited with pioneering the Guangdong model of development, exemplified by private enterprise, economic growth and a greater role for civil society, Wang began to diversify Guangdong's economy away from manufacturing already in 2007 to develop Shenzhen into an innovation hub for China's new economy. He also became an outspoken critic of corruption and nepotism and went against the “princelings”; the prosperous descendants of early revolutionaries who had not earned their own wealth. In the past half a decade, Wang has overseen several portfolios in the Li administration and often accompanied Xi and Li on trips abroad. Unlike many of his peers, Wang is known for offhand dry humor. During the 2013 US-China Dialogue, he compared the bilateral relations with a marriage. China and the United States should not "choose the path of a divorce,” he said adding, "like that of Wendy Deng and Rupert Murdoch, it is just too expensive.” Wang is among those Chinese leaders who could follow Xi or Li in the 2020s. Li Zhanshu (1950) is one of Xi’s right-hand men and his chief of staff. Well before the 19th Congress, Li stood a good chance of becoming chairman of China’s parliament, the National People’s Congress. Like Xi and Wang, Li belongs to the generation that lived through the Cultural Revolution. In fact, his very name personifies the tragedy of his parents’ generation. Born in Hebei province, Li got his name from the phrase “a letter home from the battlefield” in remembrance of his uncle’s last letter before he was killed in 1949 while fighting the Nationalists. Another of his uncles fought in the Chinese Civil War suffering crippling injuries, while still another died in Japanese captivity. He also lost his grandfather during the Cultural Revolution. As Director of the CCP’s General Office and the chief of its National Security Commission, Li is one of the key members of the Politburo. Like Wang, he joined the CPC in 1975. After studies in the night school, he was promoted to Party Secretary of Wuji County, while Xi Jinping served as party chief of the neighboring county. Li’s career took off fast in the provincial leadership and he became the Vice Governor of Heilongjiang in 2004. Regarded as a rising star, Li was elected to the Politburo in 2012. Li has also played a key role in foreign affairs. He facilitated a strong relationship between China and Russia. In 2015, Xi sent Li as his “special representative” to meet with President Putin in Moscow. Li would also pave the way to Xi’s meetings with other foreign guests, including the 2015 state visit to the U.S. Formerly head of the CPC’s organization department and its personnel chief, Zhao Leji (1957) will replace the smart and tough hands-on anti-corruption tsar Wang Qishan to become his successor as the head of the Central Commission for Discipline Inspection (CCDI). Zhao has been a member of the CCP Politburo and its Central Committee Secretariat since 2012. He has also served in Xi’s important economic reform steering committee. Like Xi, Zhao went to the countryside to perform manual labor on a commune during the later years of the Cultural Revolution. He joined the Party in 1975, entered Peking University and studied philosophy until 1980 but moved to Quinghai School of Commerce to oversee the Communist Youth League (CLY) wing. Within the CPC, this branch has stressed not just growth but equity. In the early 1990s, Zhao entered the provincial government and was elevated Party Secretary of his hometown Xining at only 42. A decade later, he became party chief of Qinghai, where his tenure was marked by rapid economic growth, even by Chinese standards. He also took a softer but smart approach on ethnic minority issues and environmentally-conscious investment projects. As Zhao took over his parents’ home province Shaanxi, he oversaw dramatic economic growth that soared to 15 percent in 2008. By 2012, he became a member of the Central Committee and a candidate for promotion into the Standing Committee in 2017. Zhao’s appointment signals great trust in his capabilities. Xi expects much from China’s anti-corruption leader who must have great integrity, high execution ability and be untouchable. Han Zheng (1954), the Shanghai party chief, will become the executive vice-premier. Born in Shanghai, Han was not sent to the countryside. He began his career as a warehouse laborer toward the end of the Cultural Revolution and joined the CPC in 1979. After serving as an administrator in a chemical equipment company and a municipal chemical engineering college, he oversaw the party organization at the Shanghai Greater China Rubber Shoe Factory, and caught the eye of the then Shanghai mayor Zhu Rongji, the popular, tough and fearless, liberal CPC boss who would serve as China’s premier at the turn of the century. That’s when Han’s career took off. Han served as Mayor of Shanghai from 2003 to 2012; a critical period of rapid growth, booming property markets, and the Expo coming out party. Thereafter he was promoted Shanghai’s party secretary, the top political job in the city. As Han arrived after the dismissal of Chen Liangyu over corruption probes during the Shanghai pension scandal, he led the municipal task force to crack down on corruption. That’s also when Xi Jinping was sent to Shanghai in 2007 and the two got to know each other. Han developed a mainly positive image in Shanghai for his openness and transparency, and for his modern and international outlook. If Beijing is a bit like Washington D.C., the nation’s political center, Shanghai is more like New York City, China’s global and financial hub, while Guangdong province is becoming known as the mainland’s Silicon Valley. All three are today so critical for China’s future that their CPC leaders are natural candidates to the Politburo and its Standing Committee. The Xi team will also include Wang Huning (1955), the CPC’s top party theorist and director of the Central Policy Research Office who is expected to be in charge of ideology, propaganda and party organization. In the West, Wang has occasionally been portrayed as a stuffy party propagandist in the old Soviet style. Nothing could be further from the reality. A born Shanghainese, Wang started his French studies in the mid-70s, but was soon enrolled in International Politics at Fudan University and began to conduct research for the Shanghai Academy of Social Sciences (SASS). In 1985, at just 30, he became the youngest law professor in Fudan’s history. By the 1990s, Wang was noticed by Shanghai’s CPC leaders, while Chinese scholars got to know him through his textbooks, such as Logic of Politics, America against America, Introduction to New Politics, Analysis of Modern Western Politics, and Analysis of Comparative Politics. In the CPC, Wang represents continuity and change. He is one of the key theorists behind the ideological stances of three administrations: the “Three Represents” by Jiang Zemin (which opened the CPC to more diverse constituencies, including business people); the “Scientific Development Concept” by Hun Jintao (which began the quest for greater balance amid income polarization); and the “Chinese Dream” by Xi Jinping (which reflects the transition from poverty reduction to the emerging middle classes). Moreover, Wang has served as Xi’s key foreign policy aide, particularly during his international trips, which has earned his nickname as "China's Kissinger." During the 19th Congress, the second vice-chairman Xu Qiliang was elevated to replace the retiring 70-year old Fan Changlong as the first chairman of the powerful Central Military Commission that oversees the military. He will be seconded by General Zhang Youxia, a long-time Xi ally. Born in Shangdong province, Xu Qiliang (1950) comes from a military family, learned piloting in 1966 and joined the CPC a year later. As reforms took off, Xu became chief of staff at the Air Force Shanghai headquarters in the mid-80s. A decade later, he was promoted to chief of staff of the PLA Air Force. Today, he is vice chairman of the Central Military Commission. In turn, Zhang Youxia (1950) is a general in the PLA and member of the Central Military Commission. A son of a military family as well, he is one of the few serving generals in China with war experience. He joined the army in 1968 at just 18 years. A decade later, he participated in the border clashes of 1979 between China and Vietnam, and the 1984 Battle of Battle of Vị Xuyên. In 2011, Zhang was promoted to General. Before the 18th CPC Congress, the PLA leadership went through a wholesale re-shuffle, which led Zhang to director of the Equipment Development Department and a member of the Central Military Commission. He is Xi’s trusted ally and the two hope to create a more modern, professional and capable Chinese military. There is also a select group of major CPC leaders who are members of the Politburo but not in the Standing Committee. Guangdong party chief Hu Chunhua, Xi’s possible successor, and the president’s protégé, Chongqing party chief Chen Miner will join the Politburo, which is one rank lower the Politburo Standing Committee. Chen Min’er (1960) is one of the Party’s younger rising stars. He serves as the Party Secretary of Chongqing, after the ouster of his corrupt predecessor Sun Zhengcai. By 2002, he was on the provincial Party Standing Committee, and served as Vice Governor of Zhejiang in 2007-12, working under then-Zhejiang party secretary Xi Jinping. As Party Secretary of Guizhou since 2015, Chen has promoted Xi’s policies, including the fight against corruption. As Party Secretary of Chongqing, Chen can still make his mark in the next CPC Congress in 2022. In 2012, Hu Chunhua (1963) was appointed Party Secretary in Guangdong where he became known as a low-profile but action-oriented leader. Emulating best practices of Hong Kong’s Independent Commission Against Corruption, Hu fought graft, while cracking down drug trafficking and prostitution. He is seen as one of the key leaders of the “sixth generation” in 2022. One of the most interesting names in the Central Committee is Liu He (1952), Xi Jinping’s trusted economic adviser. Despite his current ministerial-level rank, Liu’s international profile is higher than many other senior officials because of his close ties to Xi. In the 1990s he met Singapore’s strong man Lee Kuan Yew who told him to pay attention to urbanization. “It’ll change everything,” Lee said. “He was right,” adds Liu. A Harvard-trained economist, he is seen as the mastermind behind Xi’s macroeconomic policy. Liu has also accompanied the president on many of his overseas trips. Another key name of the Central Committee is Yang Jiechi (1950), China’s former US ambassador, Foreign Minister and member of the inner circle of the State Council as director of the Foreign Affairs Leading Group. He is one of the key architects of China’s foreign policy. Other major leaders include Ding Xuexiang (1962), one of Xi’s political aides who comes from Shanghai but followed Xi to Beijing, and journalist politician Wang Chen (1950), whose career moved from the People’s Daily to the State Council. With her trade union background, Sun Chunlan (1950) is one of China’s leading female CPC chiefs. Still others feature the party chief of Jiangsu province Li Qiang (1959); CPC Secretary of Tianjin Li Hongzhong (1956); current Minister of Supervision Yang Xiaodu (1953), who also plays a role in the anti-graft CCDI; the CPC chief of Xinjiang Chen Quanguo (1955) who has had a key role in fostering development while containing separatism. In turn, Guo Shengkun (1954) is not only the current Minister of Public Security but chief of Aluminum Corp. of China, a major state-owned enterprise. Huang Kunming (1956) serves as the deputy chief of CPC’s Propaganda Department. Coming from Zhejiang, Guo Jinlong (1955) has attracted attention as Xi’s close ally but also his use of social media and creative approaches to governance. Finally, Party Secretary of Liaoning Li Xi (1956) has served as alternate member of the CPC since 2007. 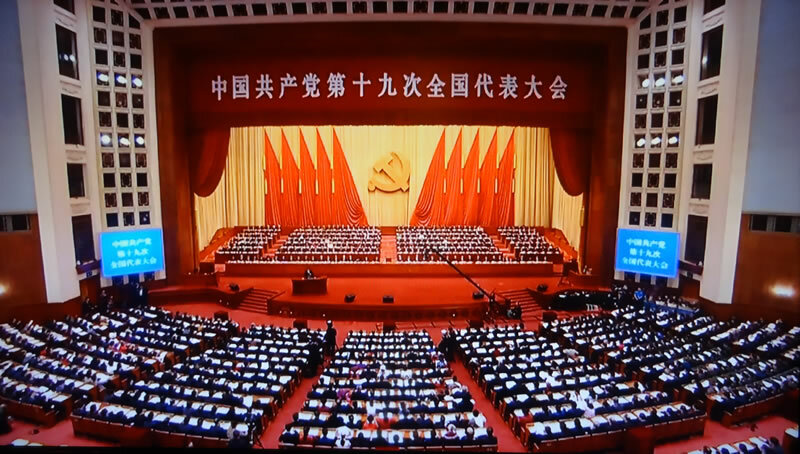 It is these members of the Standing Committee and the Politburo that are expected to implement the new grand strategy and policies. In the 1980s, Deng Xiaoping launched the economic reforms and opening-up policies that created the foundation for Chinese revival. In the 1990s, Jiang Zemin’s “Three Represents” opened the Party to more people, including business people. In the 2000s, Hu Jintao’s “scientific development concept” sought to crystallize the key aspects of the quest for a harmonious society through development. Nevertheless, these doctrines rested on the foundation of Deng’s legacy of industrialization, which had first been ignited in Mao’s 1950s and re-ignited with the 1960s “Four Modernizations” in agriculture, industry, defense as well as science and technology. But it was only Deng’s tough execution that made those modernizations possible after the Cultural Revolution and its tumultuous aftermath – followed by economic reforms and opening-up policies. So from the 1980s to the early 2010s, China’s growth rested on investment and net exports. That was China as the “world factory” of low costs and cheap prices. It was a world historical performance of double-digit growth. Yet, it would also be – toward the early 2010s – China of overcapacity and local debt; China that grew with foreign capital and domestic imitation, amid deep income polarization and great damage to the environment. It was when Xi Jinping and Li Keqiang took charge in the early 2010s, that the new transformation began with huge, pent-up force. With Xi as President and Li as Premier, a progressive transition would ensue. From Deng to Hu, Chinese policies built on industrialization. In the Xi decade, these policies are driving transition to the post-industrial society. In the past half a decade, China has begun a massive rebalancing of the economy toward innovation and consumption. The new China is represented by rising costs and prices, but also by more indigenous innovation and premium domestic brands. It is China of supply-side reforms and restructuring, painful but necessary transitions across industry sectors and geographic regions, particularly in the Northeast’s “Rust Belt.” It is China where excessive debt is no longer sanctioned and where deleveraging has begun. That highlights the importance of the rule of law, and the struggle against corruption by both “tigers and flies”; the only effective way to put people first. Internationally, “sinologists” have tried to attribute the anti-graft struggle to political consolidation, as if the goals had more to do with political posturing that ordinary Chinese welfare. That is a misperception. China is decisively moving toward the rule of law, via its anti-corruption struggle. In the Xi decade, development is not seen as a win-lose struggle between man and nature, but as a quest for an ecological civilization that China promotes through the Paris Accord – with or without the Trump administration. In the new China, prosperity is no longer seen as the conspicuous privilege of few, but as the moderate goal for many. It is a nation in which the Chinese Dream means a moderately prosperous society and the eradication of poverty. The new China is a strong sovereign state that will never again allow internal disintegration or foreign intrusions. In Xi’s China, direct investment is no longer a foreign monopoly. Now Chinese capital is moving across borders and contributing to modernization not just in China and emerging Asia - but increasingly across the world. New policies must address this contradiction, with greater economic policy focus on quality and equality of development than before. In the past, development translated to economic growth. Today, the deceleration of economic growth goes hand in hand with greater investments in social equity. That means broader and less uneven coverage of pension and health care insurance nationwide; basic public services; rejuvenation of rural areas through land and fiscal reforms; appropriate scaling of farming operations, increased spending on high school education and vocational training; more affordable housing; and extended rural land leases. In view of macroeconomic policy objectives, this medium-term agenda rests on what might be called Xi’s axiom: “Development is the foundation and key to addressing all problems.” These goals include the target to achieve “a moderately prosperous society” by 2020, which rests on the doubling of GDP per capita between 2010 and 2020. This is no longer a dream but the reality, if China’s growth remains around 6.8-6.3 percent until the end of the 2010s – in other words, despite growth deceleration that is typical to post-industrialization. Xi’s blueprint suggests that environmental protection will become as important as economic growth in the coming years. That means development of new technologies in green manufacturing and clean energy; cleaning up air, water and soil pollution; developing green finance; emissions-reduction per targets; the establishment of a new national natural resource management and ecological supervision agency, plus tighter environmental rules, and accordingly deeper impact on certain key sectors and companies. Internationally, the new China promotes more inclusive global governance creating institutions that look more like the world they pledge to serve. If the US-led Bretton Woods, Marshall Plan and North American Treaty Organization (NATO) defined the divisions of the Cold War; China promotes international cooperation, assistance and peaceful development in the 21st century. While Washington made its economic aid conditional to membership or support of the NATO, Beijing does not require membership in the Shanghai Cooperation Organization (SCO) as a precondition to participation in Beijing-led international initiatives. Today, globalization proceeds through the One Belt and One Road (OBOR) initiative, supported by the BRICS New Development Bank (NDB) and the Asian Infrastructure Investment Bank (AIIB); multilateral development banks that represent the interests of emerging and developing nations – not just those of advanced economies. The progress has been stunning. In 1980, Chinese GDP per capita, adjusted to purchasing parity, was barely 2.5 percent of the U.S. per capita income. When Xi became CCP’s General Secretary in 2012, Chinese per capita income had increased tenfold to 23 percent of the US per capita income. As the new Xi roadmap will be executed across China, per capita income could climb to 35 percent of the US per capita income in 2022. In relative terms, that corresponds to US living standards in the early 1990s and those in Western Europe in late 90s. In advanced economies, such progress took two centuries; in China, just four decades. At the end of the new leadership’s mandate in the early 2020s, China will be also ever closer to the new milestone; the moment when the size of China’s economy will surpass that of the United States – just as the U.S. once left behind British Empire in the late 19th century – and the consequences will reverberate across the globe. That’s the China Xi envisioned in his long speech at the 19th Party Congress. That’s his Chinese Dream – one that we all will know better by the early 2020s.